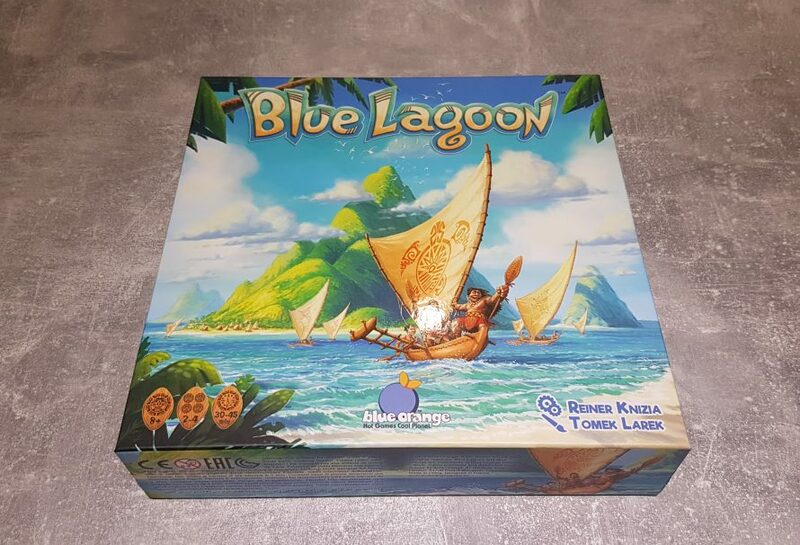 Blue Lagoon is a brand new abstract strategy, route building board game from renowned designer Reiner Knizia. Published by Blue Orange Games, the title sees 2 – 4 players spend around 40 minutes spreading across several islands of a Moana-like archipelago. With exploration and settlement, the game is split into two halves. However, after one will you want to play the other? Let’s find out! Despite the amount of tokens and pieces, setup is relatively short. Each player grabs the villages (hut shaped pieces) and settler tokens of their colour. Then, resource tokens, which represent coconuts, bamboo, water bowls, statues and a jade like precious stone, are blindly pulled from the bag and added to specific stone circle places on the board. Starting with the youngest player, the game begins with the exploration phase. During this phase players arrive by boat and can choose to place a settler token boat side up on any empty water space. 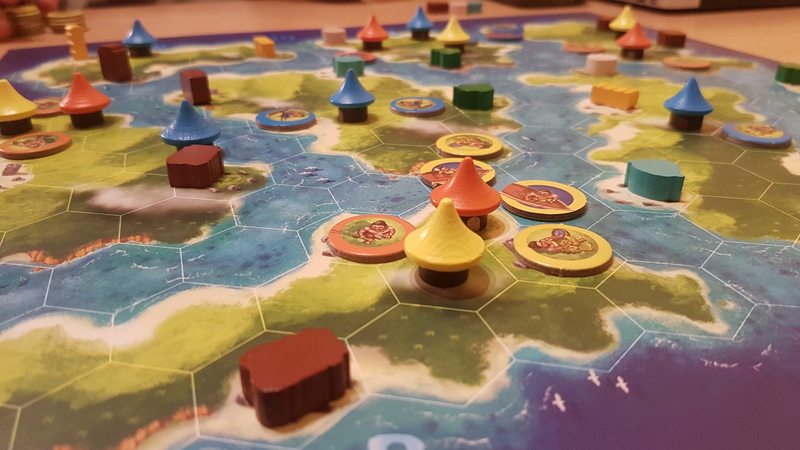 Once they have a settler in a boat placed, on future turns, the player can either place another settler in a boat anywhere on water or place a settler, or a village piece, on land onto an adjacent space from one of their boats. Getting onto land is the key to claiming resources and point scoring. For the purpose of scoring villages are counted as settlers, and while they can be used to claim resources any on top of stone circles are removed before the settlement phase. The game continues around the table with players placing a single settler or village, claiming resources and forming linked paths across the board. Once all players have placed all of their settler tokens and villages onto the board, or all resources are claimed, the end to the phase is triggered. It is now time to grab the scoring pad, something vital to making scoring an easier process – though having a calculator to hand is also recommended. If a player has got a settler or village on all 8 islands in the archipelago they gain 20 points, with 10 points awarded to those whom are on 7. Next, for each player they determine the most islands linked together by a single chain of settlers. 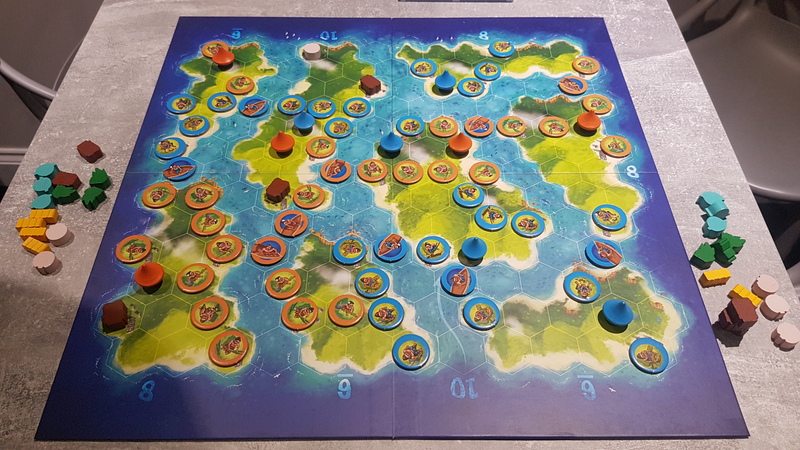 For each island included in the chain 5 points are earnt. Each island awards points to the player with majority control, with ties seeing points evenly split (with the points rounded down). For each statue piece 4 points are awarded. If the player has collected a coconut, a bamboo piece, a water bowl and a precious stone they get a 10 point bonus, only being awarded once per phase. Finally for each of those resource types, excluding statues, players gain 20 points for a set of 4, 10 points for a set of 3 and 5 points for a set of 2. Once scoring is complete all of the tokens are removed from the board. Note, this does not include the villages which stay from the exploration phase. Thematically this can be seen as the settlers returning to their villages. In the settlement phase player can no longer place boats wherever they wish. Instead, players must build out adjacently from their villages, the starting points for this phase. The resource pieces are tipped into the bag and again blindly drawn out for each stone circle spawn point. The game plays until again all players have used all their settlers or all the resources are claimed. Scoring works in the same way as the first round, with total scores then determined and the winner crowned. The way that players’ tokens spread across the board, attempting to grab resources, is extremely reminiscent of Reiner Knizia’s Through The Desert. Despite swapping desert and camels for boats, villages and perfectly white coconuts the core gameplay is the same. Two elements sets the games apart though, the change to two phases and the set collection side of the resources. 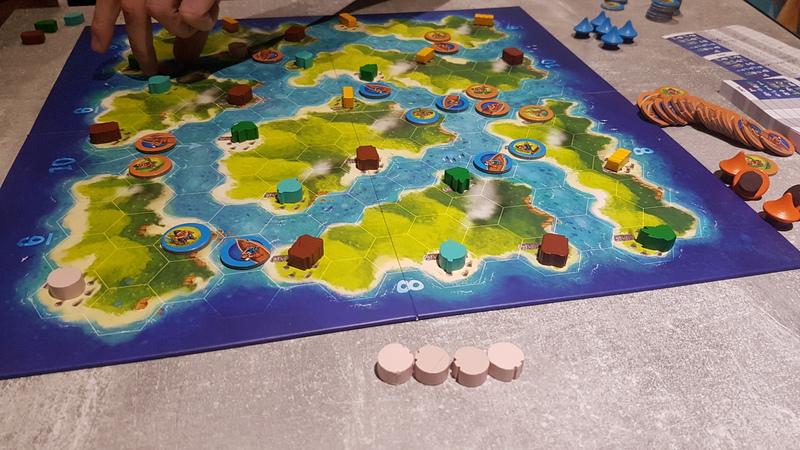 Large amounts of points can be earnt in various ways in this game, whether you attempt to link together as many islands as possible or just grabbing specific resource types to get sets. This is similar to in Through The Desert where players could go for large areas or palm trees but with more variety available. While aimed at the more casual side of gamers there is almost an overload of numbers when it comes to scoring, hence the advice to have a calculator handy. Scoring aside though the game could be perfect for families. The actions available are incredibly simple, being place either a token or a village onto the board. On top of this, with there being such a variety of ways to score points it is hard to pull off a bad move, and as far as I can tell it is impossible to make a detrimental one. At the full player count gamers can be blocked off, yet there is still the possibility to score big. Sneaking onto islands to even up the control to grab points, or ninjaing in for a resource, is possible as there are others to draw attention away from your plan. This is not the case at 2 player, where things get a tad cutthroat. With very back and forth gameplay it is hard not to make it obvious what your intentions are, something which is at the detriment to the game. Games with such simple actions often don’t allow for much in the way of tension or trade offs, yet this is not the case for Blue lagoon. Even in a four player game often two players will find themselves in a standoff for two resources. Any movement by one player towards an equally distant resource opens the door for the opponent to swoop in for the other. Unless you can sneak in while someone else distracts them by encroaching on a different resource! There is a great balance of all the information being on the board versus working out what others deem more valuable. Using this players can try to determine what they need or could relinquish to others. Component wise Blue Lagoon is a relatively vibrant game, with decent components. The use of double sided settler tokens to feature both land and boats is a nice way of limiting the piles of tokens and giving a structure to amount of tokens each player has available. In my copy some of these tokens were punched off centre, though not bad enough to cut off any of the illustrations. The village hut pieces and the resources are there to give a little visual flair and do stand out from the map – making it easier to read. Finally, the bag included for the resources is not overly needed but a nice finishing touch, and it does help the blind randomisation of the resources. It is hard to get away from the Through The Desert comparisons, yet Blue Lagoon is an entertaining game in its own right. The combination of simple and quick actions, with multiple scoring routes, creates a game that has little downtime that has choices that matter and influence the play of others. The theme is nice, making a visually pleasing game, though the ties to exploration and settlement gameplay are weak. If you are a fan of Reiner Knizia’s Through The Desert, this game has a number of similar vibes but has a mid-game twist. Blue Lagoon isn’t quite going to make Through The Desert redundant, still it is somewhat easier to get players excited to play. Previous article Pikoko Review - A Twist On Trick Taking!